Hey Kre8tors! Welcome back for a fun blog hop! The Paper Pumpkin Pop Up Blog Hop! We are featuring alternate projects for the January 2019 kit, Be Mine Valentine! This was a super cute and awesome box that coordinated with the Animal Expedition Suite from the Annual Catalog. I really liked this kit because it let us put together Pillow Boxes that we can fill with treats! 3D projects are so much fun, especially when Stampin’ Up! makes it so easy with this monthly subscription box! When I create alternate projects from my Paper Pumpkin kits, I really like to try and use only the supplies in the kit. I was able to do that with this kit and I really like how it turned out. There are so many ways to use the contents of this kit, so be sure to hop around to all of the awesome ideas from my fellow demonstrators who are in this hop! Click the next button below! Did you know that right now is the absolute best time to sign up for a Paper Pumpkin Subscription? That’s because if you get a 3, 6, or 12 month prepaid subscription, you qualify for Sale-A-Bration rewards! That’s right! FREE stuff just for getting your crafty subscription box delivered to your mailbox every month! You are definitely going to want to sign up before February 10th to get in on February’s box. Want a sneak peek at Stampin’ Up!’s creative process when designing their kits? Take a look at a short video by clicking the Paper Pumpkin graphic below! Be sure to contact your demonstrator today to subscribe to this awesome kit! Don’t have a demonstrator? I’d love to help you! Just visit my online store and purchase a subscription using the Shop link at the top right of my page. Then enter the Paper Pumpkin code that was sent to your email when you sign in to your account. Click the Next button below to hop on over to the next awesome alternate project! If your order is less than $150, use my current hostess code 2MKSGAKY when you place your order to get a thank you card from me at the beginning of next month! Your support means a lot to me and helps me to continue doing what I love, which is making videos for you to enjoy. Love your project Melissa! Adorable! 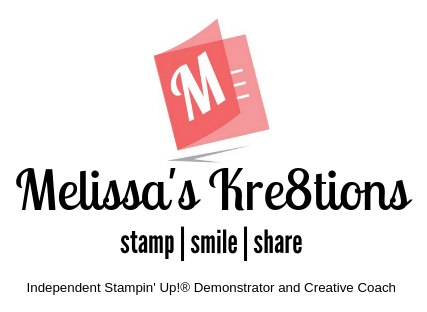 Love your cute project, Melissa! That little leaf behind the kangaroo add a lot! That’s adorable! I love the heart in the pouch! Thanks for popping up with us! So cute! Great job on using the kit product! Cute love note with extra layers! I love your process and that leaf is such a cute idea!